Vicenç Pagès Jordà has penned over a dozen works, taking in everything from short stories to essays and novels. 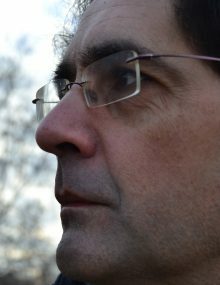 He is the recipient to the National Catalan Culture and Arts Prize to his career as a writer. Among his works, one should metion: En companyia de l´altre (Edicions 62, 1999, Documenta Prize), La felicitat no és completa (Edicions 62, 2004 – Sant Joan Award), the bestselling novel Els jugadors de Whist (Empúries, 2009 – Creixells Award) and Dies de frontera (Proa, 2014), that garnered him the prestigious Sant Jordi Prize. After the publication of the 20th anniversary edition of his first novel, El món d’Horaci (Proa, 2016) and the novel Robinson (Empúries, 2017), his latest work is the anthology of stories Exorcismes (Empúries, october 2018).